Southway for sale with a guide price of £1,500,000 is the most wonderful beachside property positioned only a few paces from the gloriously sandy beach at Bigbury-on-Sea. The views are just breathtaking, and follow along the coastline and out to sea, over Burgh Island and picturesque Hope Cove. 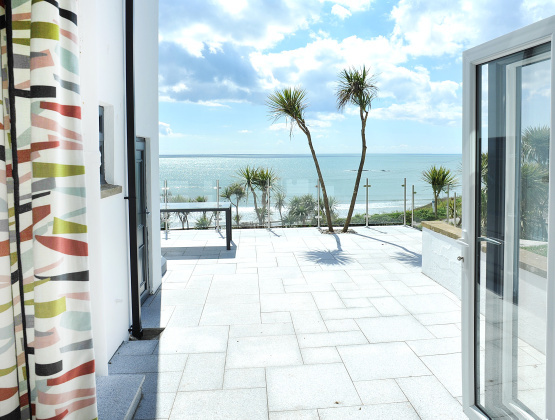 The spacious accommodation with five bedrooms, and 4 en-suites includes a magnificent sun terrace with chrome posts and glass panels providing the perfect spot for al fresco dining whilst absorbing the stunning views. The sitting room and reception hall open to a recessed patio seating area providing a sheltered spot from which to enjoy the views. Parking is well provided for with a detached double garage, off road parking to the front of the garage and a further gravelled parking area for three cars. A gate with steps leads down to the garden which is laid to lawn with a timber built boat store. The Prime Waterfront & Country House Department (01548 855590) of Marchand Petit Estate Agents in conjunction with the Modbury office (01548 857588) invite calls for further details and to arrange a viewing.